Cream de Cheek - Supple and glossy colored cheeks in an instant. Gel Cream cheek color that blends in effortlessly leaving healthy glow with soft texture leaves no sticky feeling that spread on smoothly. Use as a base and apply just before a cheek powder to enhance the powder's color. Contains Macadamia nuts oils, Vitamin E derivatives. 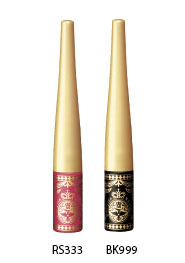 Trick On Line - A gel liquid eyeliner that delivers long-lasting glossy and defined lines for lashes and body tattoos. Sweat, oil, tear and waterproof. Contains Macadamia nuts oil, Vitamin E derivatives. Majoromantica Dream Circus Bottle - A magical aphrodisiac that awakens your inner "girl" with just one drop introduces a limited edition circus bottle for you to customize. A romatic scent of red berries infused with a bouquet of flower and sweet maple syrup. Top note : Juicy & fruity with Juneberry, Strawberry, Raspberry, Rum Bud, Apple, Fig, Mangosteen, Bergamot, Lemon & Mandarin. Middle note : Floral Sweet with Rose, Sweet Pea, Jasmine, Muguet & Gardenia. Last note : Sweet & Mysterious with Vanilla, Maple, Brown Sugar, Sandalwood & Musk. Crack Nails - A nail color that creates fissure-like patterns with just coat over nail polish.